Beirut: The Russian military is constructing a new army base in the central Syrian town of Palmyra, within the protected zone that holds the archaeological site listed by UNESCO as a world heritage site and without asking for permission from relevant authorities, an American heritage organisation and a top Syrian archaeologist said Tuesday. 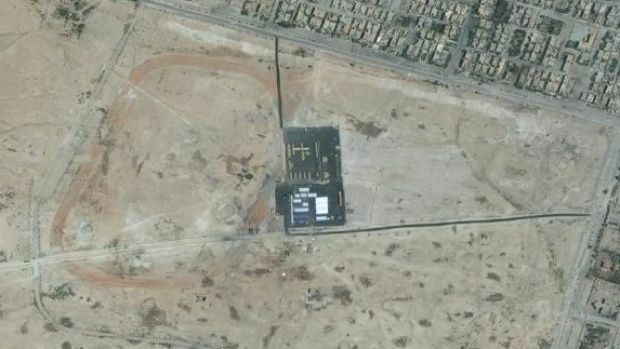 The American School of Oriental Research’s Cultural Heritage Initiative posted pictures from the satellite imagery and analytics company DigitalGlobe that show the construction on the edge of the ancient site that was damaged by the Islamic State group, which held Palmyra for 10 months. Fierce fighting has been reported between Syrian troops and rebel forces in the suburbs of the capital Damascus. Witnesses say it is some of the most intense violence in the area since the uprising against President Bashar al-Assad began more than a year ago. Reports from activists, which cannot be verified, say rebels clashed with Syria’s elite Republican Guard. The violence came as Turkey issued a stark warning to its neighbour Syria over the downing of a jet last week. Prime Minister Recep Tayyip Erdogan told parliament that if Syrian troops approached Turkey’s borders, they would be seen as a military threat. Correspondents say it is rare for fighting to take place near Republican Guard bases and suggests a growing confidence among the rebels. The elite Republican Guard, commanded by President Bashar al-Assad’s younger brother Maher, is tasked with protecting the capital. State TV confirmed the fighting but said dozens of “terrorists” had been killed and many others taken prisoner, including foreign fighters. It said large numbers of armed rebels had moved into al-Hama and tried to take control of a main road to the west in order to bring in more arms and fighters. Observatory head Rami Abdel Rahman told AFP: “This is the first time that the regime has used artillery in fighting so close to the capital. Earlier, Mr Erdogan spoke of Turkey’s “rage” at Syria’s decision to shoot down the F-4 Phantom last Friday and described Syria as a “clear and present threat”. “A short-term border violation can never be a pretext for an attack,” he said.